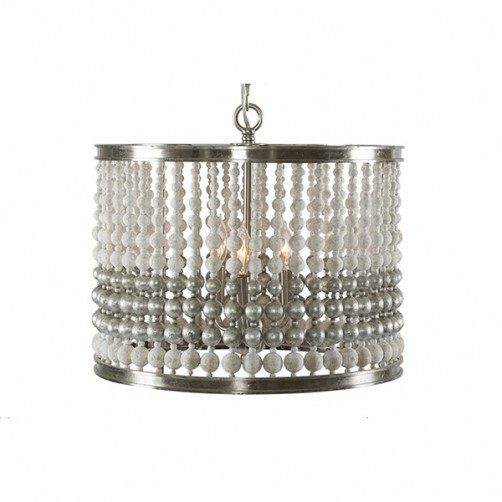 Simple, classic and elegant, with three candelabra bulbs, plenty of light will be cast through the rustic strung white and silver leafed wood beads. The nickel plated finished frame gives this chandelier a transitional look, suitable for a variety of design styles. Aidan Gray lighting is hand-crafted and created to give each light fixture the one-of-a-kind look of a true vintage find. With inspiration from European style and French flea market treasures, Aidan Gray lighting is truly an updated classic with distinct design details, aged finishes and time worn elegance. We appreciate Aidan Gray for their love of interiors, design and authentic products that exude “Coastal Elegance” with a touch of European design. Their products are made by hand, adding character with exceptional materials such as rough-hewn wood, rustic metals and antique mirror to name a few. Their collection of furniture, lighting, and home accents will be timeless additions to any interior space. Info: Ships out within 2-4 weeks of your order being placed, direct from Aidan Gray to you. Custom Upholstery orders run approximately 90-120 days.